Habitual behavior creates scale, which generates profits. Neither Uber nor Lyft have gotten there yet - and the goal seems far away. Hence the experimentation with scooters, public transit links, etc. Uber and Lyft undercut the prices of taxi services, expanding the market of those taking one-off rides but remaining too pricey for some. Only one in 10 users of ride-hailing services use these apps weekly, including just 2% who say they use them every day or almost every day. That’s down from 3% in 2015. Which means there aren’t that many folks who see ride-hail as an everyday commuting option. 22% are monthly users, while 67% say they use these services less than once a month. The services need to become less an occasional treat and more an unkickable habit. Have you been inside an Uber? How about a Lyft, or another ride-hailing service? If the answer is duh, rethink your sense of superiority. Because you’re in the minority. According to a new poll conducted by the Pew Research Center, just 36 percent of American adults say they have used ride-hailing services. 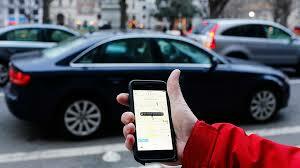 Sixty-one percent say they have heard of the services but hadn’t taken a ride. The remaining 3 percent said they hadn’t heard of them at all. That comports, mostly, with other surveys conducted in the past year about Uber and Lyft ridership, which have found that between 24.4 and 43 percent of the US population has used apps to summon rides. Though those numbers may seem underwhelming, they actually mark a substantial jump in ridership and name recognition for the ride-hailing services. When Pew, a nonpartisan research organization, ran an identical survey in 2015 of Americans 18 and older, it found just 15 percent had used the services. And a third—33 percent—had no idea what Uber and Lyft were. But this new survey also found that few riders aren’t making ride-hail services part of their daily routines, which is less great news for the long-term growth of these companies, both set for initial public offerings this year. Americans’ interactions with the ride-hailing services depend, unsurprisingly, on who they are, where they live, how old they are, and how much they make. More than half of 18- to 29-year-olds have used Uber, Lyft, and their like, but just 24 percent of those over 50 have. Fifty-five percent of college grads have hailed an Uber or Lyft, but 20 percent of those with high school degrees or less have gotten into the services. While 53 percent of those with household incomes over $75,000 have hitched ride-hail rides, less than a quarter of those making less than $30,000 have done the same. And high-income urban dwellers are way more likely to have hopped aboard than high-income people living in rural areas—71 percent compared to 32 percent. All of this makes sense. Uber and Lyft undercut the prices of many taxi services, expanding the market of those taking one-off rides but remaining too pricey for some low-income households. Young people are early adopters, meaning it has taken a while for Uber use to trickle down to the olds. And the services are still far from available everywhere. The business model is hard to work in far-flung rural areas, where riders might have to wait tens of minutes for a pickup and drivers get fewer fares. That part’s OK for the ride-hail giants: There are still riders and markets to capture (and fight over). Lyft would not confirm the Pew survey's figures, but a company spokesperson wrote in a statement that Lyft is "excited to see an increase in usage of services like ours. We're looking toward a future where car ownership is entirely optional." Uber did not respond to a request for comment. Still, the number of habitual riders is small. Only one in 10 users of ride-hailing services say they use these apps at least weekly, including just 2 percent who say they use them every day or almost every day. That’s actually down from 3 percent in 2015. Which means there aren’t that many folks who see ride-hail as an everyday commuting option. Another 22 percent are monthly users, while a majority of riders (67 percent) say they use these services less than once a month. Uber and Lyft surely know this. It’s why you’ve seen both companies experiment with new kinds of services in the past few years: subscriptions, in-app integrations with public transit, shared “shuttle” services and cheaper (but slower) carpool options. In 2018, both companies poured money into bike- and scooter-share services: Uber with its acquisition of electric bike operator Jump and Lyft with its purchase of Motivate, the major bike-share operator behind New York’s Citi Bike, DC’s Capital Bike Share, and the Bay Area’s Ford Go Bike. The ultimate goal: These companies want you to open their app anytime you want to get somewhere, no matter the distance or mode of choice. That means the services need to become less an occasional treat and more an unkickable habit.